Yesterday, Josh Gordon claimed the Cleveland Browns have the best receiving corps in the NFL. Frankly, I could care less about whether he’s right or wrong. I’m just glad he was available to make the comment in the first place. Normally, player attendance at minicamp isn’t much of a big deal. It’s mandatory, so of course everyone on the roster is present. Gordon is an exception to this, mainly because it’s the first offseason activity he’s been able to attend in quite some time. It’s also the first time he’s been a part of the team’s offseason program without the looming threat of another suspension. 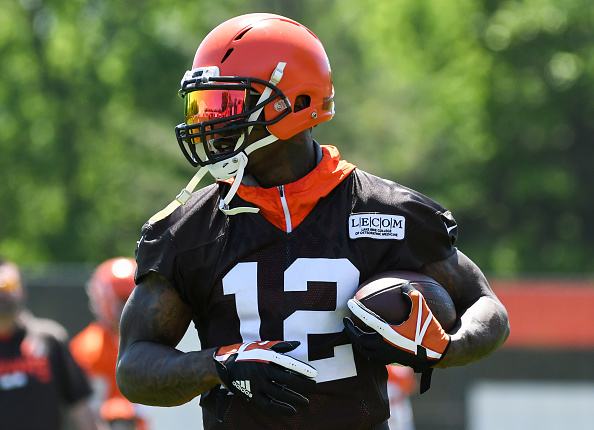 Essentially, Gordon’s presence alone is already providing a huge boost to the Browns well before the season starts. Usually around this time of year, we aren’t uttering Gordon’s name without following it with some iteration of “applying for reinstatement.” Every season since 2013 has involved drama with the star wideout, as failed drug tests continued to put him in hot water with league discipline. Though he took part in training camp and the preseason in 2016, he ended up heading to rehab just days before he was allowed to return from his most recent suspension. For a while, the concept of having Gordon available in Week 1, much less the entire offseason program, seemed like nothing but a fantasy. Now, after years of watching him put his career in jeopardy, the Browns have their Pro Bowl wideout in the fold for the entire summer. It goes without saying the impact this has with the team is huge. To start, Gordon being at camp and not off serving a suspension ensures he’s in game shape by the start of the season. Sure, various pictures from minicamp hardly indicate he’s been avoiding the gym. That said, his recent trend of rejoining the team late in the season has resulted in him showing off significant rust. Despite clearly being the most talented wideout on the 2017 roster, his performance was inconsistent across the final five games of the season. Having him present all summer long also ensures he can develop chemistry with Cleveland’s quarterbacks, another issue he’s struggled with when making midseason comebacks. In the past five seasons, Gordon has worked with seven different Browns QBs. This, alone, is difficult to overcome. Having to do adapt to a new quarterback on the fly after returning from a suspension makes it even more of an uphill battle. Now, Tyrod Taylor and Baker Mayfield can get plenty of work in with Gordon, ensuring each has a chance to get in rhythm with him. Regular season games will be less of a feel-out process for whoever’s under center. The hope is this will go a long way towards Gordon returning to Pro Bowl form. To me, though, there’s no bigger benefit to having him on-hand for the full offseason program than eliminating all the distractions the team dealt with over the past five years. The front office isn’t feeling any anxiety about whether he’s worth the trouble or if he should just be cut. The coaching staff isn’t being asked if they’ll welcome Gordon back when he’s reinstated. Players aren’t peppered with questions about the team struggling without him around. Now, sure, it’s still difficult to believe Gordon is finally on the straight and narrow. That he’s gone this far into the offseason without a single issue is significant, but he’ll need to keep it up to fully gain enough trust from the front office before it considers locking him up to a contract extension. That’s a discussion for further down the road. Right now, it’s just a pleasure to see Gordon at camp without a single issue hovering over him. For a Browns team badly trying to shed its reputation as a leaguewide laughingstock, this will certainly help the cause.